Vovinam Championship national youth XIII 2015 Cup competition was closed Vinatex morning June 23, at the stadium Le Trung Kien (Tuy Hoa – Phu Yen), Ho Chi Minh City Union of delegation with 14 gold medals . On the final day of competition, the athletes compete in four 33 kg weight class antagonism female, male 45 kg, 48 kg and 39 men ages 12-15 kg men ages 16-18. 33 kg weight class finals women’s Pacific Nguyen Ngoc Thy overcame Tu Quyen Hoang host athlete to win a gold medal for 3rd for their units. Meanwhile, men’s 48 kg class, Le Hoang Duy (Vinh Long) pass Tran Duc Ngoc Hai (People’s Police) to win the Gold Medal. In men’s 45 kg weight class, Tran Huy Han (Quang Ngai) injury can not play so Nguyen Tien Thanh (People’s Police) vang.Huy gold medal at 39 kg weight class males ages 16-18 belong Nguyen Xuan Luan (Dong Nai), beating Kieu Phuong Nam (Hanoi) in the final drama. 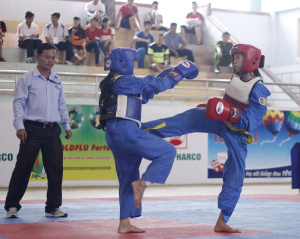 The tournament will compete from morning till June 19 June 24 to 32 units with near 500 Athletes, Coaches, referees (451 fighters) attended by Vietnam Vovinam Federation and General Fitness Sports and the Department of Culture, Sports and Tourism held in Phu Yen province. The boxers competing in two age groups 12-15 and 16-18 years old, with 59 sets of medals. Among them, 8 and 16 sets of medals right weight class antagonism (8 men) in the age group 12-15. As for the age group 16-18 will have 16 content rights antagonistic and 19 weight classes (10 male). Through tournaments create favorable conditions for the unit best preparation for a national Phu Dong in 2016 was held in Thanh Hoa. In recent years, the country Vovinam movement flourished and the unit has a strong focus on the training of children. Through the tournament showed significant improvement of local boxers. Especially in the weight class antagonism many units have a large investment and gradually affirmed its position. Results of award shows, the medal of the weight class no longer focused on a group that underwent two equally (Thanh Hoa 6 gold medals, Ba Ria – Vung Tau 4 gold medals, 3 gold medals in Phu Yen Quang Ngai 3 gold medals, 3 gold medals Hanoi, Dong Nai 3 gold medals). Meanwhile, in the content rights, the South still prevail when won most gold medals, especially Ho Chi Minh City (10 medals), Can Tho (10 medals) and Vinh Long (2 gold medals). Ho Chi Minh City was briefly led with 14 gold medals, 6 silver medals and 5 bronze medals; Tho runner when 10 gold medals, 4 silver medals and 9 bronze medals; Thanh Hoa is ranked third with 6 gold medals, 4 silver medals and 2 bronze medals.